It is great sadness that we report the passing of William Hawes. William was a member of both Headington and Thame. The funeral will be held Oxford Crematorium on 8th April at 2pm. Thoughts are with Katherine and Sheila at this difficult time. This year’s ladies county finals were held at Oxford City & County on the 25th & 26th July. The weekend kicked off with the ladies singles, under 25 singles and unbadged pairs. The ladies singles saw Caroline Campion (Banbury Central) beat Katherine Hawes comfortably denying Hawes of a 14th title. The under 25 singles game was a nail biting affair with Jazzmin Alder from West Witney beating Katie Glenn from the hosting club by just one shot. In the Unbadged pairs Maureen De Paauw and Sue Stewart from South Oxford beat Wendy Rossiter and Linda Price from Headington. The morning’s games was followed by the ladies pairs in which Campion teamed up with Carole Galletly and Hawes with Donna Knight. The game was extremely close with nothing separating the two teams. Campion and Galletly managed to edge away to a 4 shot lead going into the final end with Hawes & Knight only managed to pick up 3 on the last end to lose by 1 shot. The second day saw a change in the weather, which made conditions very tricky for the finalists of the 2 wood singles, triples and fours. The 2 wood singles saw club mates Carol Gaskins and Jeanette Berry (Oxford City & County) play each other in another close final. Early on, it looked as though Gaskins would race to an early victory but Berry fought back to claim a 3 shot win. The triples also saw two teams from the host club play each other. Knight, Gail Gilkes and Hawes beat Vicky Harrison, Margaret Stacey and Jacky Gray by a sizable margin. A hot shot on the first end set the scene for the game. The Fours final involved 2 teams from Banbury Central. June Bone, Gill Sharpe, Galletly and Campion pressed on to an early lead but as conditions changed rapidly during the morning, Mo Cox, Sue Waring, Annie Gilkes and Anne Norton claimed the title with a 4 shot victory. Singles: C Campion (Banbury Central) 21, K Hawes (Oxford City & County) 6. 2 Wood Singles: J Berry 13 (Oxford City & County), C Gaskins (Oxford City & County) 10. Pairs: C Galletly, C Campion (Banbury Central) 18, D Knight, K Hawes (Oxford City & County) 17. Triples: D Knight, G Gilkes, K Hawes (Oxford City & County) 35, V Harrison, M Stacey, J Gray (Oxford City & County) 10. Fours: M Cox, S Waring, A Gilkes, A Norton (Banbury Central) 20, J Bones, G Sharpe, C Galletly, C Campion (Banbury Central) 16. Under 25 Singles: J Alder (West Witney) 21, K Glenn (Oxford City & County) 20. Unbadged Pairs: M D Paauw, S Stewart (South Oxford BC) 21, W Rossiter, L Price (Headington) 10. Two triples from Oxford City & County have qualified for the national triples championships held at Leamington spa in August. The triples qualifying rounds were held at Banbury Borough on Sunday 28th June. Vicky Harrison, Margaret Stacey and Jacky Gray qualified comfortably beating Pauline Illott’s triple by 14 shots in the quarter final before claiming victory from Gill Lambourne’s trio by 9 shots in the semi final. Donna Knight, Gail Gilkes and Katherine Hawes had a close fought battle with Caroline Campion’s team in the quarter final sneaking a 3 shot victory before beating the hosting club’s triple skipped by Angie Ives by 11 shots. Quarter finals: P Illott 15, J Gray 32; Gill Lambourne 18, C Bloomfield 16; A Norton 15, A Ives 18; C Campion 13, K Hawes 16. Semi Finals: J Gray 20, G Lambourne 11; A Ives 9, K Hawes 20. 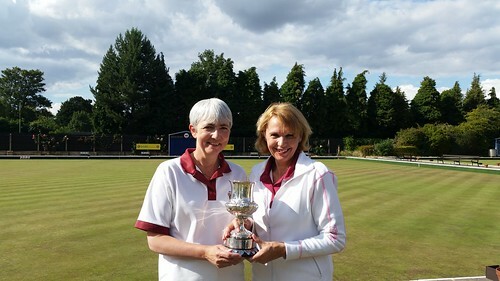 Katherine Hawes and Carol Penson (both Oxford City & County) have qualified for the National Singles Championships held at Leamington Spa in August. 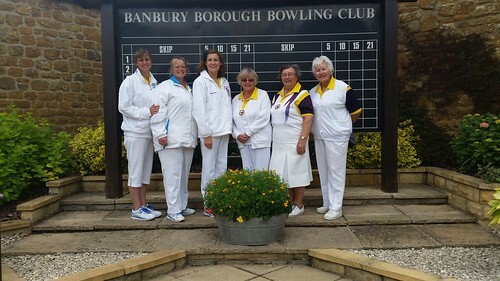 In the semi finals played at Banbury Chestnuts, Hawes beat Carole Walker of Banbury Borough 21 – 3 after beating Jeanette Berry, also from Oxford City & County, 21 – 17. In the other half, Carol Penson beat Pat Ostler from Bloxham 21 – 10 to qualify after beating Jackie Stafford from Shiplake. Oxfordshire came from behind to win by two shots in the Middleton Cup trial against Northamptonshire on Saturday. In testing conditions with wind playing a big part at Oxford City & County BC the visitors settled quicker overall and led by sixteen shots at five ends. The gap had closed by two at ten ends with some of the Oxon combinations, playing together for the first time, now starting to gel and find their form. During the next five ends our players continued to apply pressure and at fifteen ends the score stood level. The lead then fluctuated by no more than three shots either way until the end when some good containing play resulted in a narrow Oxfordshire win by 131 shots to 129. The Oxon players are all now very much geared up to winning a place in the starting twenty-four against Middlesex in the first Middleton Cup game on 31st May and next up in the trial process is the trip to Barnwood BC on Saturday 17th May to play Gloucestershire. 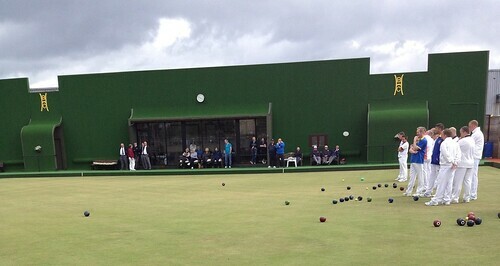 The Oxford and District Bowls League, sponsored by Yarnton Nurseries, was, finally, blessed by fine weather. In Division 1 the race for the title really opened up. Headington A remain top despite being held to a draw at Banbury Central. Only two matches were played in Division 2 as Witney Town were touring. Bicester remain top, having beaten Kidlington by four shots. In Division 3, Watlington remain top despite a heavy defeat at Chipping Norton. The home side winning on all four rinks. Bloxham beat City and County B by a single shot, helped by Tony Gardener’s rink’s ‘hot shot’ eight. Banbury Central B maintained their current good from in Division 4, winning away at leaders Adderbury. However, Chadlington beat Hanborough by an even bigger margin and go back to the top. Central meet Chadlington next week in a match that could determine the top two in the division. Following the Middleton Cup victory over Hampshire the day before, Oxon’s ‘top eight’ went into the regional semi-final of the country’s most prestigious team competition in good form with high hopes of a victory against Kent despite their opponents boasting an extremely strong team and playing in their home county. The early ends were fairly close affairs and at five ends Alan Prew with Ian Snowdon, Nathan Lewis and Keith Holloway led Shaun McCaughan’s rink by four, while Howard Watts playing with Mark Sykes, Paul Sharman and Jon Philpott trailed Gordon Charlton by only one. The gap had closed from three to just one at ten ends with great play from both teams. As with the Middleton Cup at Atherley the third quarter was better for the opponents than Oxon. Charlton seemingly could do no wrong and opened up a nine shot lead at fifteen ends whilst McCaughan narrowed the gap to two at the same stage against Prew. On the respective twentieth ends Watts with his last bowl cut the score against him down to one while Prew’s rink picked up a massively valuable four to put Oxon one up going into the last end. Watts and his team all put bowls into the head and put pressure on Charlton who, with his last bowl, played an Oxon wood in for shot. Lewis drew a shot which stayed for Oxon until the final bowls on the other rink but then Prew, with his last bowl, looking to cover space just behind the jack moved it slightly and sat alongside. Oxon then, held game with just McCaughan’s last bowl to come. Credit to him, having missed with his first, with his final effort he trailed the jack perfectly for a Kent four and two shot overall victory. This was a great game of bowls and a fantastic advert for the game. Every player gave their all for the cause but on this occasion it just wasn’t to be. Kent went on to lose the final to Hampshire who had beaten Middlesex in the second semi-final. It couldn’t have been any closer as Oxfordshire made it through to the next round of the Balcomb trophy by beating Buckinghamshire on an extra end at Princes Risborough BC. Oxon lost to Bucks at the same venue last year, this year was very evenly matched. Mark Sykes rink finished 19-19 and Howard Watts 20-20. Howards Rink played the extra end and held on to win the match. Oxfordshire will now play Berkshire in the next round. Oxfordshire bounced back in the second trial against Gloucestershire at Banbury Central! After a narrow loss away against Northamptonshire at Roade BC the second trial went more Oxfordshires way, winning on 4 rinks and taking the match by 20 shots. Mark Sykes was Oxfordshires best rink of the day finishing 34-12, Ian Snowdon suffered Oxfordshires highest defeat losing 18-25. The full result card is in the Middleton Cup results section. Welcome to the new look Bowlsoxfordshire site, here you will find all information regarding the Mens and Womens associations. The new site is still under development in certain areas but all the competitions and fixtures are available. There is a comments area on some pages so please feel free to use them if you have any suggestions or find anything incorrect. So please feel free to Navigate round using the menus available!